Each evening in Italy we started our meal with a bowl of salad. I loved that the selection of vegetables were simply but beautifully prepared and tasted so fresh. My favourite dish was the courgettes. They tasted so very courgette-y! Knew I’d be preparing them in the same way once I returned home. And with a garden exploding with courgettes, that’s exactly what I’ve been doing. Almost every day, in fact. 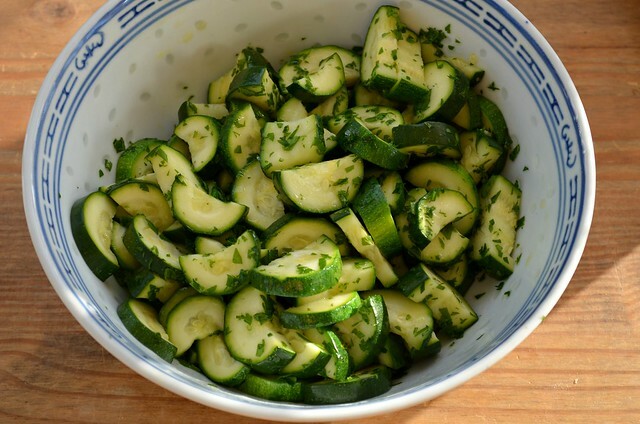 With a dish this very simple, it’s important that the courgettes are very fresh and aren’t too large. Also, if you have a special bottle of olive oil, this is good time to use it. Add the whole courgettes to a pan of cold well salted water. Bring to the boil and simmer for 2 minutes. Drain the courgettes and run under cold water so they don’t cook any more. Slice the courgettes lengthways then into 0.5cm pieces so they are little semi-circles. Toss with a good glug of olive oil and gently toss with the parsley. Keeps well in the fridge for a couple of days.